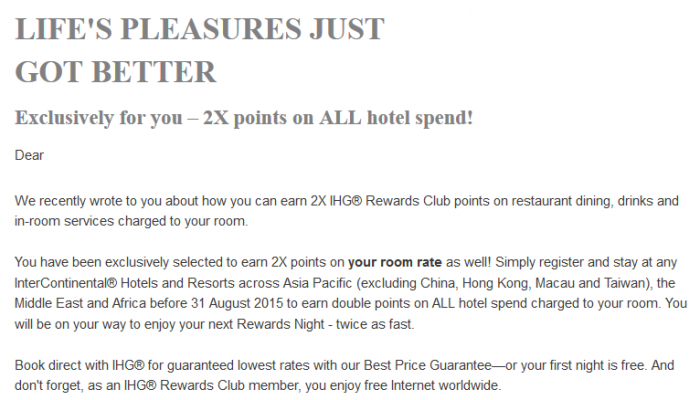 IHG Rewards Club has now extended the double points incidentals promotion for hotels in Asia-Pacific, Middle East & Africa (read more here) to include the room rate as well. The offer is valid for stays between May 6 – August 31, 2015, and excludes hotels in the Greater China (China + Hong Kong, Macau & Taiwan). It is likely that the offer is only available for those that have their IHG Rewards Club account registered in one of the participating countries. Nice double points without any limitations. Must be a IHG® Rewards Club member and must register member number in advance to participate in this promotion. Double IHG® Rewards Club points will be awarded on every qualifying stay at participating InterContinental® Hotels & Resorts in Asia Pacific (excluding China, Hong Kong, Macau and Taiwan), Middle East and Africa between 6 May and 31 August 2015. A stay is defined as one night or consecutive nights at the same hotel, regardless of frequency of check-in/out. A stay is qualified when paying qualifying rates, which include most business and leisure rates. Only one room per member per stay will be awarded the applicable bonus points. Offer cannot be combined with any other offer or promotion unless otherwise stated. Please allow up to 4 to 6 weeks for points to be credited after checkout. This offer is subject to standard IHG® Rewards Club Membership terms and conditions and earning structure, which can be obtained by visiting www.ihgrewardsclub.com. This exclusive offer is valid for original recipient only and cannot be combined with other promotions. Only original recipients will be awarded the applicable bonus points.